On March 21, 2014, 28 year-old Bernal Heights resident Alex Nieto was shot and killed by San Francisco Police; his death would become one of the central pillars of the city's movement against police violence. However, accounts of his death implicates gentrification as much as it does the notoriously racist SFPD. 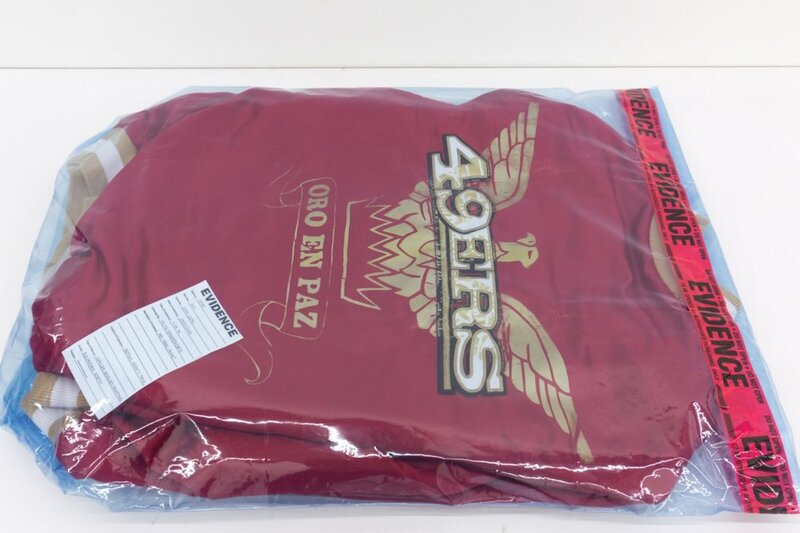 That night, a recently-arrived white tech professional called the cops on Alex after misidentifying the young Latino man as a gang member due to his red 49ers jacket. This piece explores the dissonance of associating one of San Francisco's most enduring cultural symbols (one particularly beloved in the very poor and working class communities of color being priced out) with criminality. The phoenix of the San Francisco flag silkscreened in gold on the back of the jacket reaffirms this threatened subculture's place in the city. The city motto, chopped in half, translates to "Gold in Peace" (the other half of the motto is "Iron in War"). In this era of prosperity for San Francisco, for whom is this peacetime? Can the city's longtime poor and working class residents of color wear their red and gold in peace?